Quaggas are an extinct subspecies of plains zebra that lived in South Africa until the 19th century. It was long thought to be a completely distinct species, but genetic studies have shown it to be the southernmost subspecies of plains zebra. They are considered particularly close to Burchell's zebra. The name, Quagga, was named for a sound that they make, it sounded like "kwa-ha-ha". They are believed to have been around 257 cm (8 ft 5 in) long and 125–135 cm (4 ft 1 in–4 ft 5 in) tall at the shoulder. They were distinguished from other zebras by their limited pattern of primarily brown and white stripes, mainly on the front part of their body. Their rear was brown and without stripes, and therefore more horse-like. This distribution of stripes varied considerably between individuals. Little is known about the quagga's behaviour, but they may have gathered into herds of 30–50 individuals. Quaggas were said to be wild and lively, yet were also considered more docile than Burchell's zebra. They were once found in great numbers in the Karoo of Cape Province and the southern part of the Orange Free State in South Africa. After the Dutch settlement of South Africa began, Quagga were heavily hunted as they competed with domesticated animals for forage. While some individuals were taken to zoos in Europe, breeding programs were unsuccessful. The last wild population lived in the Orange Free State, and the quagga was extinct in the wild by 1878. The last captive specimen died in Amsterdam on 12 August 1883. 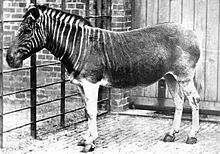 Only one quagga was ever photographed alive and only 23 skins are preserved today. In 1984, the quagga was the first extinct animal to have its DNA analyzed, and the Quagga Project is trying to recreate the phenotype of hair coat pattern and related characteristics by selectively breeding Burchell's zebras.